John Travolta, Connie Nielsen, Samuel L. Jackson, Giovanni Ribisi, Brian Van Holt, Taye Diggs, Cristian De La Fuente, Dash Mihok, Tim Daly, Roselyn Sanchez, Harry Connick, Jr.
Six soldiers went out. Two came back. What happened to the military's most elite commandos? In their first on-screen reunion since their Oscar® -nominated performances in Pulp Fiction, John Travolta and Samuel L. Jackson co-star in the white/black knuckle thriller Basic. 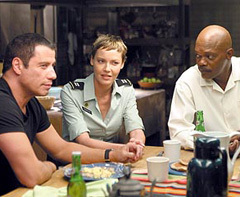 When a legendary commander (Samuel L. Jackson) and several of his men turn up missing, the last thing the government wants is a rogue DEA agent (John Travolta) investigating the disappearance. As the investigation unfolds, the agent is placed in direct conflict with the Army's official investigating officer (Connie Nielsen) and nothing is as it seems. The Big Cheese Royales are back together for the first time since the Big Q. Has to be worth a shot. Not so sure about the director though. Never forget, that - McTiernan was responsible for one of the worst movies of this (or any) Millennium - Rollerball!! Am I Scratching Your Surface?